Samara is situated in one of the most beautiful natural spots along the Volga river, as it bends around the Zhiguli mountains at the point where the river Samara joins it. It is the sixth largest city in Russia, a major hub for air, rail and river traffic, and a centre of the Russian aerospace industry to which the main local football team owes its name – ‘Krylya Sovetov’, literally translated as ‘The Wings of the Soviets’. During the early days of World War II Samara became Russia’s substitute capital in case Moscow was occupied, thus everything from embassies, businesses to even the Bolshoi Theatre was relocated to the city. It even features a bunker built for Stalin which he never visited, now a major tourist attraction. Due to military secrecy, Samara, or Kuybushev as it was called during the Soviet era, was one of the ‘closed’ cities for foreigners after World War II. An important trading and industrial as well as agricultural port city, Samara historically welcomed new migrants, especially during rapid economic development of the 19th century. The Germans, Jews, Poles, Finns, Tatars and many other ‘peoples of the Volga’ thrived. To dig deeper into the history of Samara and the different nationalities who lived there over the years, it is recommended to visit some of the places that represent the city’s heritage and that of the ‘peoples of the Volga’. Two chapels stand out from this period: the Catholic Cathedral and the Lutheran Kirche which is also the German national and cultural centre. The area of the city south of Maslennikova prospekt can be roughly described as central and thus more safe and pleasant to explore on foot. 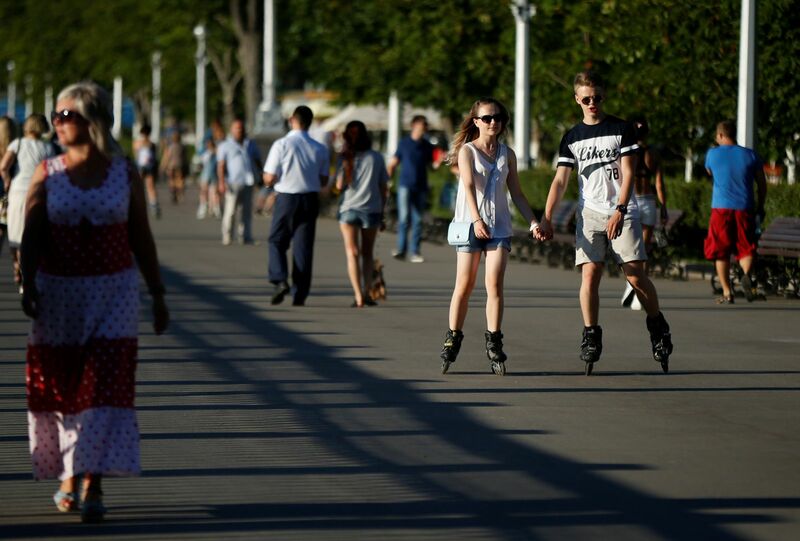 Highlights include the pedestrian Leningradskaya street, or the Volga river promenade with cycle lanes, yoga classes, city beaches and amazing views. Just stroll through the historic centre to enjoy the architectural legacy of the many different nationalities that have thrived in Samara. The economic drive of the late 19th century meant that rich merchants and industrialists attracted the best architects from all over Russia and Europe, turning Samara’s historic center into an architectural gem, with wooden and brick art nouveau houses. Soviet and imperial architecture also left their marks on the city. Unfortunately, many buildings are now crumbling due to a lack of maintenance and upkeep but you can still get a grasp of an unforgettable city charm. ‘Traveler’s coffee’ at Kuybysheva str, 95. 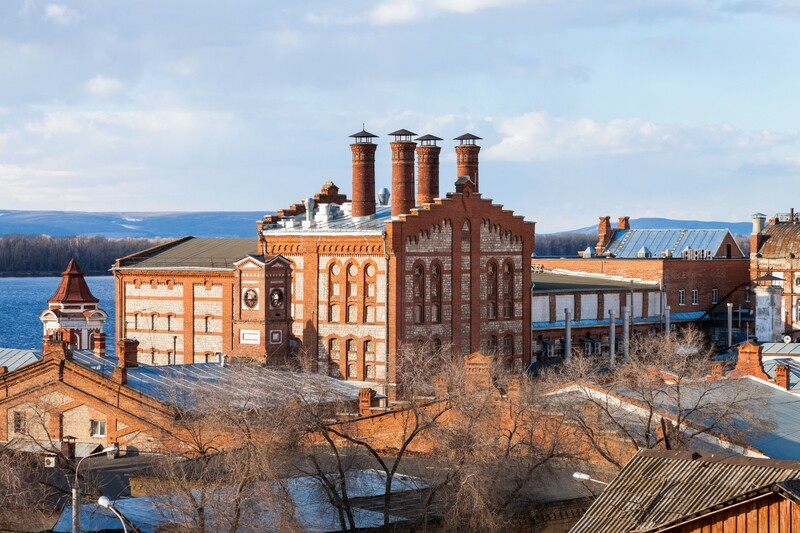 Another mark of the 19th century is the legendary Zhigulevskiy brewery, founded in 1880 by the Austrian Alfred Von Vacano brewing what became the legendary Soviet beer ‘Zhigulevskoe’. Dozens of breweries try to brew the beer under the same name today, but only in Samara can you try the real one. The best places to do so right outside the brewery are ‘Na Dne’ (The Bottom) bar and the more upscale ‘U Vacano’ restaurant. ‘Na Dne’ is an iconic place you will struggle to get a table at; always crowded by white and blue-collar workers alike as well as those who frequent it daily after breakfast. It is probably the best place to experience authentic Russian beer culture with non-pasteurized lager on tap and dried or smoked fish from the Volga, as well as boiled crayfish, or ‘raki’. The years after the collapse of the Soviet Union and the new economic development brought many new labour migrants from Central Asia, as in many other Russian cities. The best way to explore their culture is through food – with plenty of ethnic cafes around the Gubernskiy market. The historic center and the river promenades should be safe for minorities but mind avoiding remote areas after dark like Zapanskoy and Poselok Schmidta area, Zavodskoye shosse industrial area and Metalurg area in Kirovsky district. Some hate groups operate in the city and are known to attack LGBT+ activists. Locals advise to refrain from wearing any rainbow symbols and exercise caution when walking with a partner. The ethnic minority communities in Samara are well organised with Tatar, Jewish, Chuvash, Mordvin, Bashkir, Azerbaijani, Tajik, German, Polish among others. The state-supervised ‘House of Peoples’ Friendship’ on Voronezhskaya str. 9 was established to help all ethnic communities preserve their culture and traditions, while serving as an instrument of dialogue with the authorities. Celebrating the diversity of Samara’s population, local businessmen and authorities are building an open air ‘Park of People’s Friendship’ to serve as an ethnographic exhibition of all ethnicities that made up Samara’s population historically. The park will not be completed before the World Cup but you can get in touch with the House of Peoples’ Friendship to learn more and possibly get an excursion to the construction site. Samara’s history of diversity is quite unique even by Russian standards. The anti-Semitic ‘Pale of Settlement’ was not so strictly observed and finally abandoned in 19th century Samara, allowing first the Jewish soldiers, then merchants to settle. The beautiful Great Choral Synagogue on Sadovaya str, 49 was built in Samara in 1908 only to be shut down and converted to a bakery. Many religious buildings were demolished or converted into schools or factories during Soviet times in a drive to promote a secular identity of the ‘Soviet citizen’ above any national, ethnic or religious identities. The synagogue is now under reconstruction, but you can still visit the site to enjoy the architectural style. The present-day Jewish community in Samara is very active with several functioning synagogues and community organisations. Another sign of Samara’s thriving diversity is the historic mosque built in 1891 that was complemented by one of Russia’s largest new mosques built almost a century later. The civil society landscape in Samara was quite lively until the ‘Foreign Agent’ law was introduced, making the operations of many human rights NGOs nearly impossible. 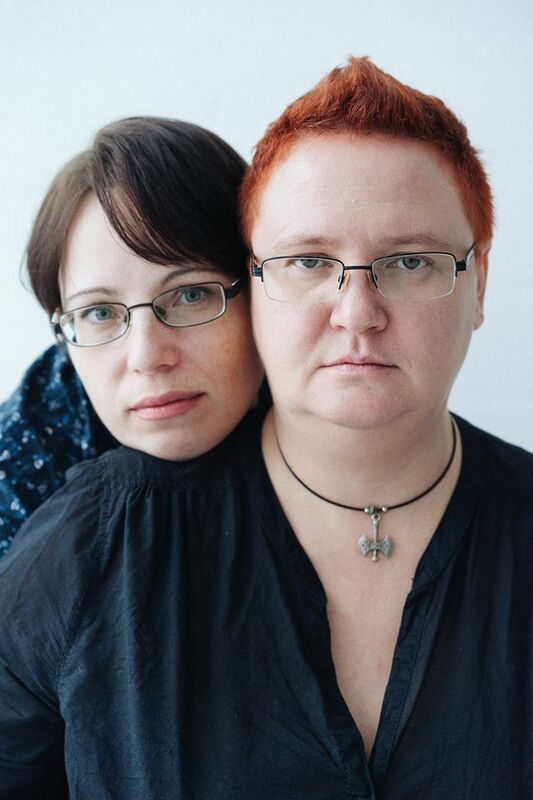 Initial attempts to introduce the ‘gay propaganda’ legislation united the local LGBT+ community, leading to the creation of what is now one of Russia’s most prominent LGBT+ organisations – the ‘Avers’ movement. ‘Avers’ runs a community centre, the address of which is not public for safety reasons, and provides legal and psychological support. It also organises community activities and monitors hate crimes against LGBT+ people. Aside from the harassment and hate crimes threatening the LGBT+ community the local law enforcement, specifically the ‘Center for counteracting extremism’ or simple center ‘E’, displays disproportionate attention to LGBT+ activists in Samara. ‘Avers’ volunteer, Yevdokiya Romanova, was brought to court and fined 50 000 RUB under the ‘gay propaganda’ law in 2017 for sharing several news items mentioning LGBT+ on Facebook. If you would like to get in touch, please contact info@farenet.org. Samara football museum at Molodogvardeiskaya str, 148 is a unique place. The only public football museum in Russia, it was founded and run by the football-mad Sergei Moiseevich Leybgrad. Poet, publicist, TV and radio journalist, historian, human rights activist and the biggest fan of Krylya Sovetov. Leybgrad knows every detail about football in Samara. He is the author of many chants of Samara supporters including one that ends with ‘Football in Samara is more than football’ (it is poetic in Russian). The museum does not receive much support from local authorities because of criticism aimed at Leybgrad’s human rights related activities. You can find the museum located on a side street off the main Kuybysheva square, where football began in Samara. It is a must-visit for every football fan. Samara’s football history starts from a German PE teacher Johan Wilhelm Sillander who introduced ball games to pupils of the Realschule in Samara. By the beginning of the 20th century almost every ethnic and religious minority community in Samara had its own football team. Krylya Sovetov’s greatest footballer of all time was Galimzyan Khusainov, an ethnic Tatar who later starring at Spartak Moscow and played at two FIFA World Cup Finals in 1962 and 1966. Krylya Sovetov never shied away from diversity in its team. They signed the first foreign footballer from outside the Soviet Union in 1989, Bulgarian Tenyo Minchev, plus the first Colombian and Argentinian players in Russia. The Ghanaian Baba Adamu was loved by the locals in the mid 2000’s. In 2011 after a match against Anzhi, a Krylya Sovetov fan threw a banana at Roberto Carlos. The images went viral along with the Brazilian legend’s reaction. Krylya Sovetov became one of the few clubs to have a fan group (the ‘T.O.Y.S’) banned by a Russian court (in 2017). They were condemned as an extremist organisation whose members organised hate motivated attacks on minorities. Central Asian migrants and foreign students were advised to keep away from the streets during football matches in the city in 2000s. 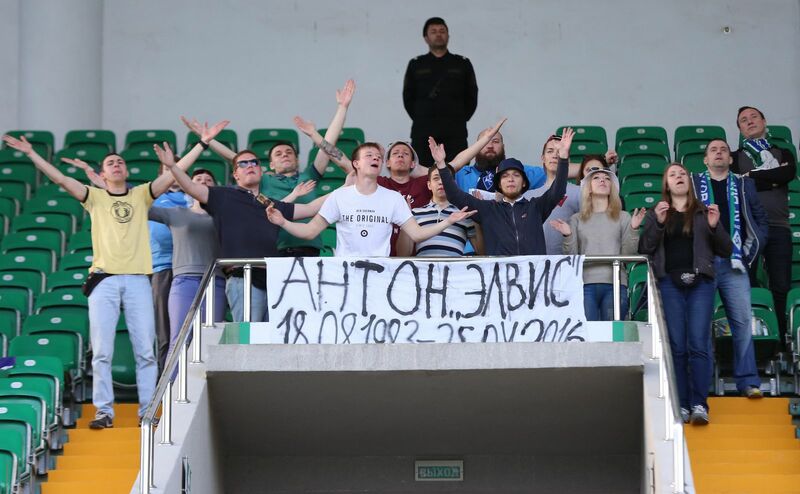 The situation has started to improve recently, but the Krylya Sovetov fan scene has a long way to go in order to match their team and city’s diverse footballing history.